The book community had mixed reviews concerning this book. As for me, I did like the book. The reading experience was good too. The story was not confusing despite it having a lot of characters. I am not a fan of Enne. As for Levi, I find him to be interesting. The story had a lot of ideas which I love. It had gangs, magic and a sinister plot. However, I think the story could be executed better. I would love to read the next book and see if Enne would grow her gang while having Levi as a friend on the side. I gave this book a 4.5 hearts rating because I like the story and its ideas but the writing style maybe not for me. There are portions where I was just irritated with Enne. This is because she was trying hard to resist the influence of Sin City and it really was futile. I did love Levi. He was interesting because of his facets. The book ends with lots of questions. First of all, no one knows who made up the organization of bad guys.. Second is will Enne and Levi become a couple in the next book.. Third is how will Enne survive with her new powers and identity. I will read the next book in the series but it is not a priority. Disclaimer: This review is my honest opinion on the story. I did not receive any kind of compensation for reading and reviewing this book. I am under no obligation to write a positive review. 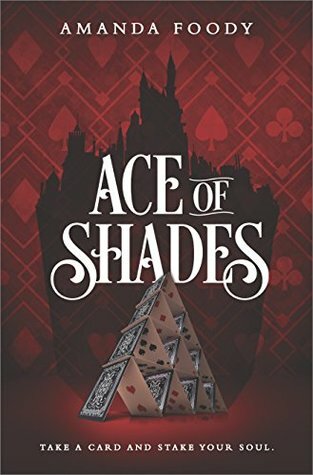 I purchased my own copy of Ace of Shades by Amanda Foody. The book photo and synopsis here is from goodreads.com.